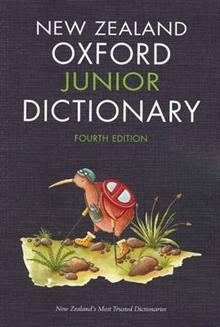 The New Zealand Junior Dictionary 4th edition is written for 7-10 year olds and is the most comprehensive dictionary available for New Zealand students in this age range. This significantly updated edition contains over 400 colour headwords with many new entries that reflect cult... read full description below. The New Zealand Junior Dictionary 4th edition is written for 7-10 year olds and is the most comprehensive dictionary available for New Zealand students in this age range. This significantly updated edition contains over 400 colour headwords with many new entries that reflect cultural and technological changes. A major feature of this new edition is the expanded appendices which cover the following: word origins, shapes, machines, science and technology, Maori words, biological classification words and a section called ?my body: inside and out? Dianne Bardsley is a lexicographer and the Director of the New Zealand Dictionary Centre, at Victoria University of Wellington.